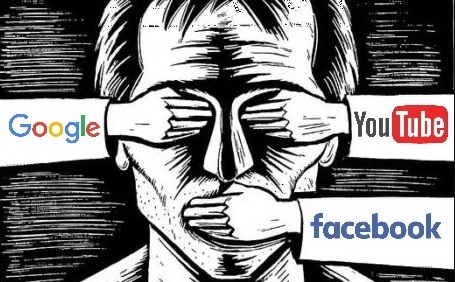 Independent Media readers are well aware of the multitude of ways big tech and social media platforms have been censoring conservatives, from demonetizing video channels, to blocking, banning and shadow banning conservatives, to limiting the reach of promotions and by "tweaking" algorithms so that search results push Independent Media sites so far down that they can rarely be found. They also colluded to completely deplatform Alex Jones, where a dozen different services cut ties with him, or terminated service all within a 24 hour period of time. This morning The Daily Caller published an exclusive blockbuster report showing discussions by Google employees, where they debated whether to bury conservative media outlets content in their search results, after Donald Trump won the 2016 president election, in order to prevent him from winning again. A Google spokesperson told The Daily Caller "Google has never manipulated its search results or modified any of its products to promote a particular political ideology. Our processes and policies do not allow for any manipulation of search results to promote political ideologies." Any Independent Media website owner, including here at ANP, can tell from looking at the data that Organic traffic from Google (from searches) slowed to a trickle after the 2016 election, as others have also found that Google employees were warning advertisers about their "brand safety," if they allowed their ads on certain websites,. The point here is despite the denials of social media giants and big tech, there is a coordinated effort to limit the visibility, and revenue generation, of Independent Media websites. Over the past few weeks I personally have noticed that any email notification I get from the commenting system Disqus, telling me someone has commented on an article thread, when the "Reply" option is clicked so that I will be brought to that comment on our website, Google's Gmail warns me it is a "Suspicious link." Then the message states "This link has been flagged as suspicious. Are you sure you want to proceed to disq.us?" Then it offers the choices "Proceed" or Back" with the "back" option highlighted. A couple points here. 1) The email notifications are an opt-in option that are set in the Disqus settings. I, of course, have every comment left on ANP sent to me via that email notification, in order to be able to keep track of PipeLiners commenting, or spammers, or trolls. That brings up the question of who would be "flagging" those notifications? Anyone can turn those notifications on via Disqus, and by the same token, they can turn them back off as well. 2) When we click "Reply" via the email, the link takes readers to ANP, not to Disq.us, in order to respond, comment or even just read the entire thread of comments. Next: ANP's Newsletter, which I have automatically had sent to myself every time we send one out, and have done so for years, is also being flagged by Google's email system, now telling me "This may be a spoofed message. The message claims to have been sent from your account, but Gmail couldn’t verify the actual source. Avoid clicking links or replying with sensitive information, unless you are sure you actually sent this message. (No need to reset your password, the real sender does not actually have access to your account!)" They then offer the option to "Report Spam," or to click the "Looks Safe" option. I repeat, I have had the newsletter sent to this account, from this account, since we began sending them years ago, so telling me they "could not verify the source," when at the bottom of every one it says "Powered by Mad Mimi," and has our P.O Box, city, state, and zip code listed, as is required by email newsletter services, provides plenty of verification of who sent it. Exactly how much verification do they need? ANP is not alone in Google flagging our newsletters either, as InfoWars was also sent a screen shot from a user who was told that their newsletter were "Dangerous." The message reads "This message seems dangerous. Many people marked similar messages as phishing scams, so this might contain unsafe content. Avoid clicking links, downloading attachments, or replying with personal information." Moving along, we have also been notified by a reader, who was kind enough to send us a screen shot, showing that for some odd reason, they were marking some of his comments on another website as "Detected as spam" Having gone through his commenting history, nothing is "spammy" about his comments at all, they are simply his viewpoint on a variety of topics. When Disqus takes it upon itself to mark a comment as spam, they put said comment into moderation for website owners to approve, which means that reader/commenter would generally think he is being censored by the website owners, not realizing it was Disqus, unless they went to their own Disqus dashboard as this person did, to see that message. Each example above are ways big tech is using to discourage visitors from clicking the newsletter links, or the "reply" options in their email notification. Regular users typically ignore that nonsense, because they have been coming to ANP, or another Independent website for years, but those new to Disqus, or new to receiving the newsletter, or new to a website, would justifiably wonder if Google is right and the site, or link, or newsletter was "dangerous," or "suspicious." The reason I highlight Independent Media as being targeted by the examples above is because many of the liberal news outlets and liberal blog owners, have ended their commenting section, disabled them and/or removed them completely, so the majority of sites using Disqus are more likely to be conservative, Independent Media websites. There is no doubt in my mind that Google listing sites as suspicious, or links as dangerous, is a deliberated targeting of independent Media. They don't want users to read IM sites. They definitely are doing everything in their power to prevent users from clicking over and joining or reading the conversations or debates. They apparently would prefer for "deplorables" to not communicate with each other at all. Independent Media readers need to be aware of these new types of attacks, in addition to the ongoing social media censorship, as Facebook and Twitter recently banned conservative investigative journalist Laura Loomer, permanently. Like Alex Jones, one does not have to agree with everything these Independent voices report, say or do, to stand up against the outright censorship against them. In response to those bans, Laura Loomer handcuffed herself to the doors of the Twitter headquarters on Thursday, to protest the censorship. Armed with a bullhorn, and signs, including one that said "Twitter, Jew Hatred?," she spent hours explaining the issues to those passing by and streamed it live. Below she explains exactly why she did it. As she explains below, this is not just about her, it is about the "political warfare" being waged against conservatives on social media and by big tech. For those that want to see her whole protest, chaining herself to the Twitter headquarters, the nearly two hour long video is below.